A CABG is an abbreviated version of Coronary Artery Bypass Grafting which is a surgical procedure that helps improve blood flow to your heart muscle. Developing heart disease means that you have narrowing of the arteries around your heart (your coronary arteries). The blockage is essentially bypassed by using a vein from your leg, an artery from your arm or your mammary (breast) artery. When the vein or artery is taken from your leg or arm one end of it is inserted into the aorta (a large vessel coming from the heart) and the other end is attached to the coronary artery below the blockage. When they use the mammary artery the artery is already attached to the aorta so only one end is released and attached to the area below the blockage. As there is no obvious scar from using the mammary artery, people sometimes underestimate the discomfort from releasing the artery. There is a line from the breastbone to the left breast that can be quite painful after the surgery. Why can I not just have a stent? Sometimes the narrowing in the artery can be very long so a stent may not be long enough to cover all the narrowing, then CABG is the only option. Also if the lesion is on a bend on the artery when the lesion is it is not suitable for stenting. 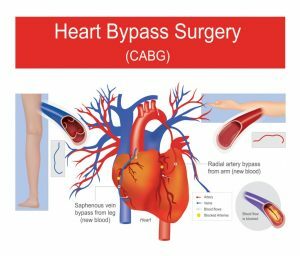 Also if you have diabetes the best option may be to have a bypass. How long does it take to recover from a CABG? After the surgery it takes six weeks for the breastbone to glue together and another six weeks for it to consolidate. However it is major surgery and it can take up to two years before you feel the full rewards from the surgery. Each month you will feel better and you can start to get back to the things you did before the surgery within 6 months. You will be given advice before you leave the hospital regarding an exercise programme and wound care. You will also be referred to a cardiac rehabilitation to help you on your physical and emotional recovery and also to help you manage your heart disease. Heart 2 Heart Cardiac Physiotherapy offer cardiac rehabilitation programmes in Mount Merrion, UCD, Naas and Kilcullen. Tuesdays at 8am, 9am and 10.30am. Wedbesdays at 11am, 2pm, 3.30pm & 5pm.